Upasani Baba, a saint and disciple of Sai, included a stanza in his hymn on the glory of Sri Sainath. It reads "Aham bhava heenam prasannatma bhavam" which means 'one who is without ego has a soul serene'. A Perfect Master like Sri Sai, God Incarnate, who has consciousness of oneness, has no limited feeling of 'I'ness. Although He lived like an ordinary, mortal man, He did not have attachment to His body. He did not wish that everyone should reverentially treat Him or glorify Him. A man called Nanavalli came to Sai Baba, who is revered by many as a Guru, and spoke impudently "Get out of Your seat, I must sit". Baba did not get angry or annoyed. With a calm smile, He got up and offered His seat to him. Nanavalli sat on the seat for a while, got up and prostrated before Baba and left. What would we have done if we were in the place of Baba? We would have thought of Nanavalli as an arrogant, mad fellow. 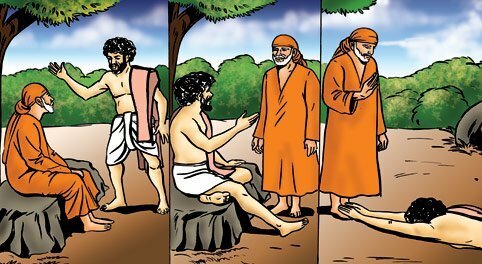 The lesson we can draw from Baba's gesture is this; if someone, taking pride in one's wealth, possessions and pomp, hurts or humiliates us, we should treat such persons and such situations as trivial and temporary as we constantly remember Sai and see Him in all as the Eternal One. We must pull out a man caught in the flame of arrogance. We can do so when we are cool-headed and remember Sai, the Abode of Serene Peace.